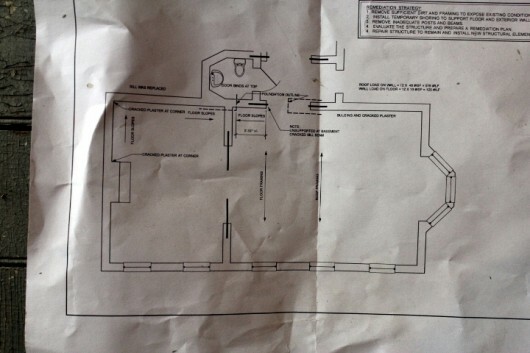 Here is the architect’s drawing of the wing. It describes the room’s many issues, along with a remediation-strategy. Welcome to my cellar. Here, contractors mortared the loose foundation-stone on the wing’s northeast side. This job took several days to accomplish, and, as I mentioned earlier, it required 4,000 pounds of cement. Several new “footings” were poured. 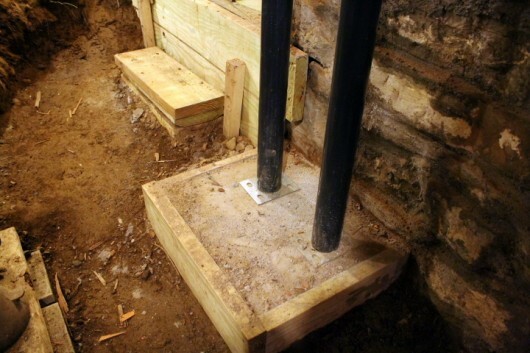 Footings are stable, non-sinkable points where support columns can be placed. 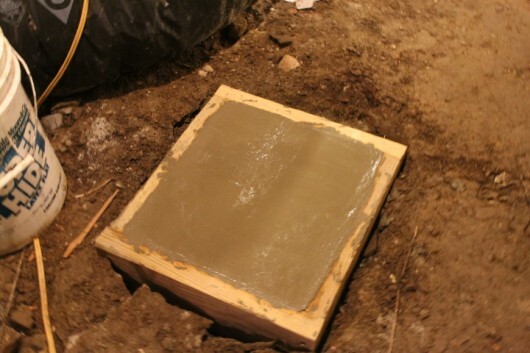 True Confession: When I saw the above frame of freshly-poured concrete, thoughts of Grauman’s Chinese Theatre danced in my head. It took all the willpower I could muster not to place my hands — or write my name — in the wet cement. The columns pictured above are temporary. Permanent supports will be placed after the workers finish jacking-up the wing. 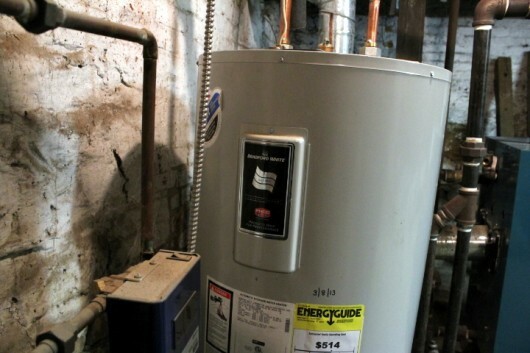 Would you believe my hot water heater up and died the moment that restoration work commenced? Well, it did. Pictured above is the new hot water heater. But that’s not all, folks. 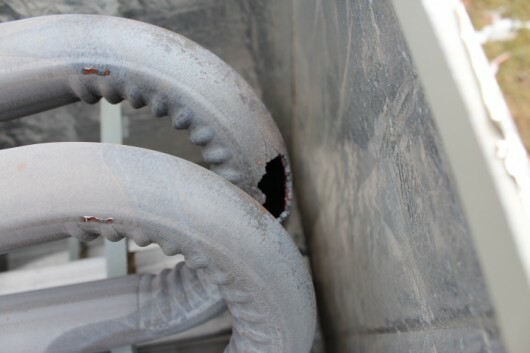 Two weeks later, the forced hot air furnace that heats the Music Room wing developed a crack in the fuel line. I seriously considered waiting until September to purchase a new furnace. That is, until the temperature in the room plummeted to 30 degrees. I could see my breath in the room. Oh, Lordy, when it rains…it pours. Acres of pressure-treated wood were brought in to create new floor joists. The original, 1850 joists had decayed, thanks to previous owners who had stuffed moisture-holding, rot-inviting insulation between the joists. Oh. If you look at the photo above, you’ll notice iron jacks on the right. These are used to lift the floor. The floor in the music room needs to be raised approximately 4 inches. 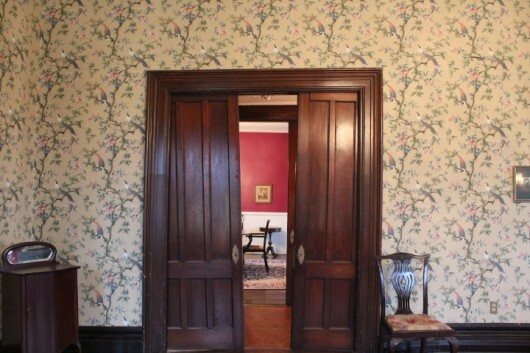 You haven’t lived until you’ve witnessed the initial jacking-up of a 163-year-old room. Nerve-wracking doesn’t begin to describe it. 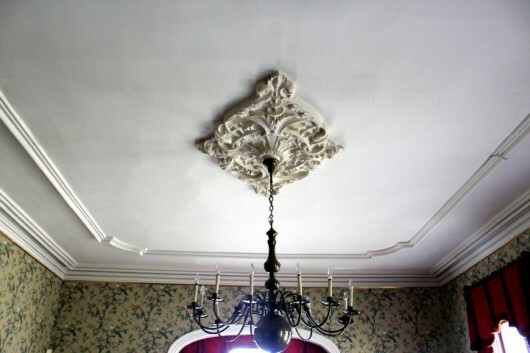 As I listened to the creaking and groaning of the floor, I prayed the ceiling — which has elaborate plasterwork and a center medallion — would not be damaged. And it wasn’t. But we have many more “jacking-ups” to go. You see, the room can be lifted only a fraction of an inch at a time. Then the wood must relax before it can be manipulated again. Good news! The first jacking caused one crack to immediately slam shut. Bad news! Other cracks developed. Good news! The new cracks are minor. If necessary, I can live with them. And do you remember the pocket doors on the east side of the room? These, as I showed you two weeks ago, and as pictured above, would not close at all. Both doors were lopsided. But look at them now! After the room was raised about one inch, the doors are nearly perfect. And according to the architect, minor adjustments are all that is needed to create a tight fit. And tight-fitting pocket doors are what we’re after. Then we can heat the room more efficiently. 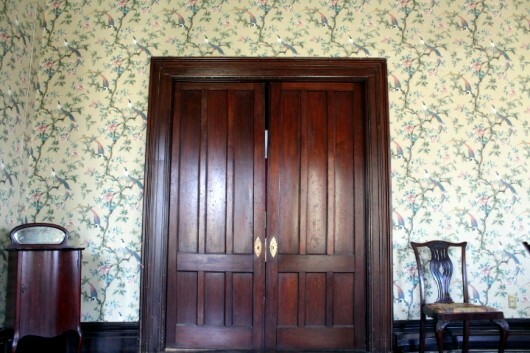 On the north side of the room is another set of pocket doors. The door on the right (where the floor had sunk) now slides effortlessly. However, the door on the left, which used to slide effortlessly, is now…stuck. Hopefully, a minor repair will fix this issue. 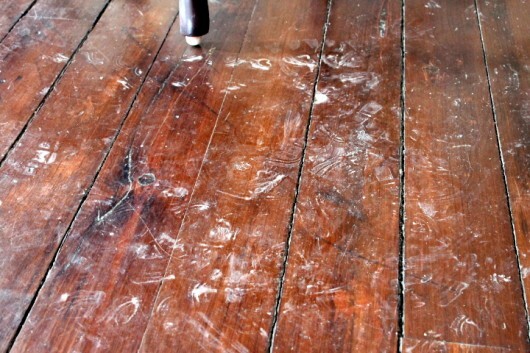 You wouldn’t believe the dust that soared through the floorboards and into the room while the contractors worked below. And each time the contractors came upstairs (which was absolutely necessary — I don’t mean to complain here), they deposited the mud from their boots on the pantry floor…the dining room floor…and the music room floor. Consequently, my best friend and dancing partner throughout the restoration-ordeal has been…a Rubbermaid mop. I fill the mop’s receptacle with highly-diluted white vinegar. The solution does wonders for the 19th century floors in this house. Well. The architect says we’ve “saved” the music room. And that is music to my ears. For we love this house, and feel it is our duty to maintain and preserve it for future generations. 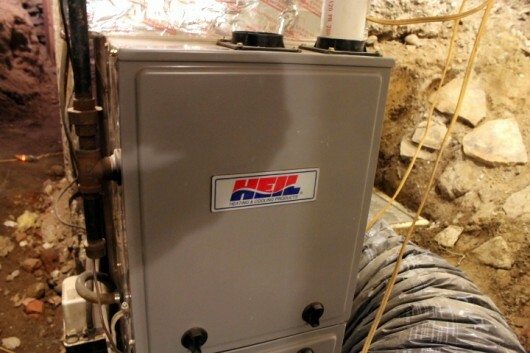 Sometimes we feel discouraged spending money on “invisible” parts of the house – furnace, etc. Your undertaking was HUGE (!) and I’m sure the house is happy to have more secure, and level, floors. The ceiling is beautiful, and I’m glad no damage was done during the leveling. The sliding doors are breathtakingly beautiful. 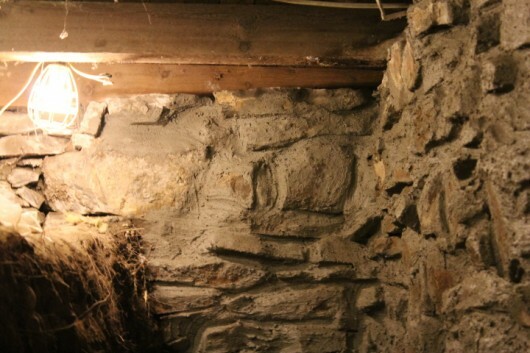 Do you plan to do anything about other cracks that developed or is the room complete? 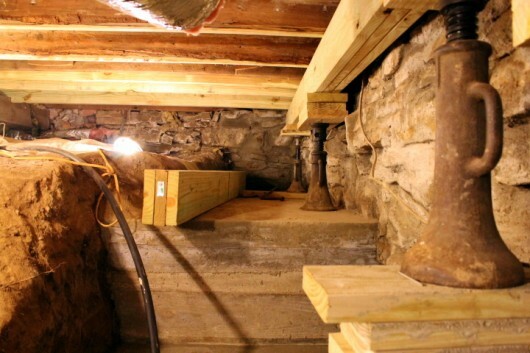 Hi Deb from Wisconsin – Although the foundation is now secure, permanent supports must be placed in the basement. These will go up once the jacking-up of the wing is complete (several weeks from now). Cracks will have to be filled by the contractors. 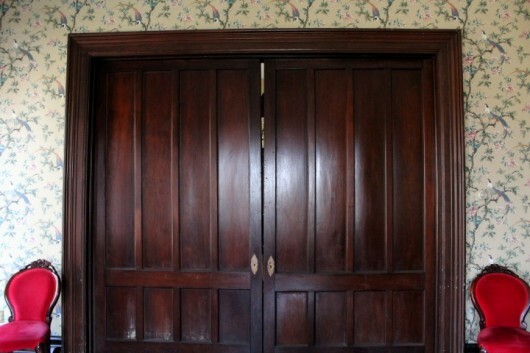 And finally, I intend to refinish the mahogany pocket doors and frames. Well, that’s the plan! I feel your frustration with the problems racing in all at once. We had a 1915 Craftsman that ‘did’ the same thing. As soon as we started one project, sure enough, something else would happen and then another…it was all worth it though! Nothing like when it’s all done and you can kick back and appreciate all that glorious wood and architecture. Your room is so lovely even with it’s cracks and uneven floors! You have done a fantastic job of decorating! Hang in there, it’s almost done! Bravo Kevin! What a nail biter! I wish you all the luck in the world on your project. Our house was built in 1978 and they sure don’t make them like they used to. Despite the expense, dust and noise of the repairs and replacements, I envy you that beautiful home. I miss living back East. Originally from the Philly area, I regularly lusted after Revolutionary War era stone farmhouses! I love old houses and other construction from the past. I almost swooned at the sight of the original Roman stone wall remnants remaining in London near the Tower. I’m so happy your house has such a devoted owner now! Your not alone, our pain will be worth it. My house a 1927 Craftsman Foursquare and we had orginally hoped to be in it by Easter, now I’m hoping for Memorial Day. I would rather the craftsmen do the jobs right. We don’t have any structural work in the house, the garage will be a challange when we get there. We are rewiring, new gas lines (losing some of the gas space heaters :(, a little roof work, gutted the bare bones kitchen and breakfast room, some new plumbing, 2 new HVAC systems, new water heater, some drywall all new paint, tinting a few windows, a few new window treatments, removed 7 window AC units – 2 remain in questionable areas, we don’t want to remove until we know we don’t need them. Stripping some painted woodwork, screening some floors and refinishing the ones that have to be refinished. Purchased a few things for the house but really no place to put them yet. We will survive and be thrilled! Please tell me more, oh master of all things beautiful, about the vinegar treatment for cleaning your floors. While my floors are nowhere near as beautiful as yours, they are solid wood and definitely in need of cleaning. I tried mop ‘n’ glow on on a test square and glad that I did for the results were horrendous. Once the floors are cleaned, is it ok to wax them? I love these posts! It’s really fun to see these improvements being made! I do have to wonder – how was Lily during all of this? My goodness, that is quite a project. I remember in your last post you mentioned needing to carry dirt out of the basement a bucket at a time. Did the work crews handle that or did you participate in that exhausting labor? Congrats on the progress! Gretchen – What a sweet compliment! I mix 2 parts common white vinegar to about 10 parts water. Vinegar contains just enough acid to break down grease. 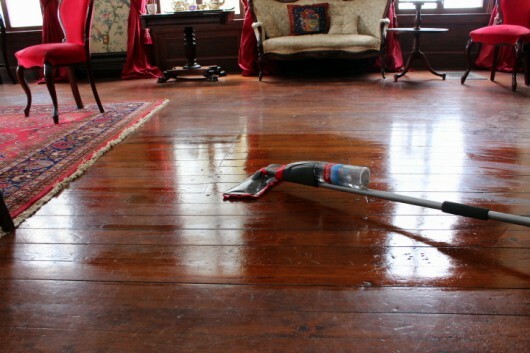 Always best to thoroughly clean a wood floor before applying wax or any other kind of shine-enhancer. I don’t wax my (ancient) floors because they are already finished with polyurethane. To give my kitchen floor a glossy boost, I rely on something called “Quick Shine.” You can find this easy-to-use product in most hardware stores. Donna – I keep the music room doors closed. Consequently Lily the Wonder Dog is barely aware of the restoration-work. badger gardener – Mercifully, the contractors managed the bucket-brigade without any assist from me. My job? Endless clean-up! I spent several anxious weeks with the NE corner of my 2.5 story house being supported by rail road ties and jacks while the contractor chipped out spalled grade beams and replaced the steel rebar and then gunited new beams in place. I feel your pain. So… why didn’t you write your name in the wet cement? I would have written my name in the cement. My home is 215 years old and i certainly know uneven floors. My cat jumps on my rolling walker and rides from dining room to living room just for fun almost every night. My basement has numerous jacks as the house just sits on a big piece of shale. Mice love me! Bless you and your partner for restoring your lovely home. People leave imprints on the houses (and the earth) they turn into homes, that remain for as long as the house stands. My son jacked up a three-story Victorian apartment house that he restored in the center of historical Bordentown, New Jersey. Fortunately he, too, knew how to do it. I’m so glad you are being patient and doing the job right, so that magnificent house lasts another 150 years! Gorgeous, but then, you know that! That is amazing!! Thanks for the blow-by-blow. Since I live in the land of earthquakes I have non-closing pocket doors, sloping floors, and windows that popped out of their warped frames. I never knew these could be fixed by jacking up. I just finished having an outdoor retaining wall straightened up. It got bollixed up in our most recent quake. With your inspiration maybe I will get the house straightened up. Or maybe not, since they keep on warning us about the pending “BIG ONE”. Your music room is fantastic. So what’s a little dust? We moved into a 1984 home (certainly not as old or elegant as yours) but had to replace all floors, strip all wallpaper, paint all rooms, and change all light fixtures, among many other things. I am just totally impress with the beauty of your music room. Let the sounds of music begin. 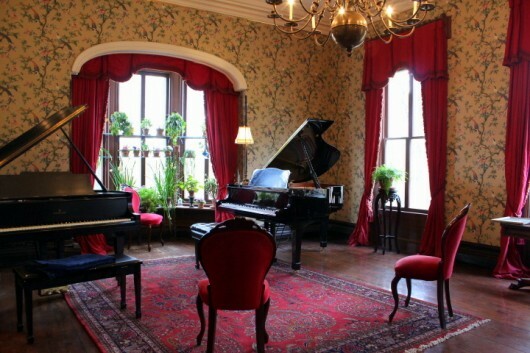 I notice that there are 2 grand pianos in your music room; are both you and your partner musicians? Ann – I’m not only a cook and a gardener — I’m a pianist, too. And there’s a third grand piano behind the set of pocket doors! We are restoring an 1800’searthquake home that was moved 20 yrs ago. I totally understand all that you are living through. We are having to reinforce the ceilings in all of the rooms, they are all sagging and cracked. You have to love plastered walls. At the same time, we have to reinforce the basement so the walls will carry the weight of the ceilings. What a mess. But, She will be a treasure on the prairie when she is done. They don’t build them like they used to. Can you share with us the vinegar mixture that you use on the floors? I have been looking for something natural to use on ours. Thanks and the Music room will be elegant again with your tender loving care. How did you manage to do all this work and not move everything out of the room ( especially delicate musical interments… the dust must be deadly to them!) and cover the floor with canvas? 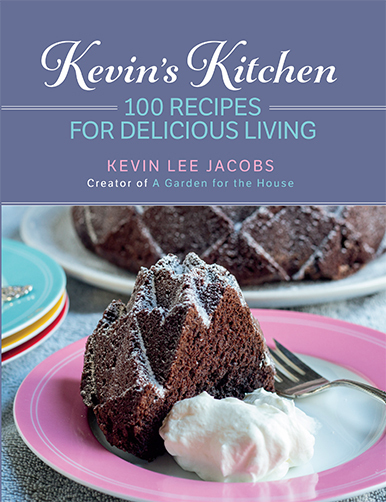 Congratulations, Kevin. It’s great to see the pocket doors closed. After all that dust, are you renaming the house the Villa D’Usty? You guys did a beautiful job. Hi Kevin! Thanks for the update. I find it very interesting that the wing just ‘rest’ after each lift, before beginning the next. Congratulations on finding this stellar sounding contractor. I believe that makes all the difference. That and your constitution ;)! Update! Spinach in the ground yesterday along with tatsoy and claytonia. The latter 2 are new to me and I am excited to watch them grow. Is your spinach in yet? Wow, wow, wow! What a monster project. And then that furnace and hot water heater biting the dust. The nerve! I’m so glad you are able to have the work done that needs to be to keep your beautiful house in good repair. And that you have the fortitude to weather it! Well, you are a wonder, anyway, Kevin, with all your talents. A pianist, too! Talents galore, you have, and bravo for developing and using them and most especially for sharing them with all of us, your followers! I wish many blessings on you and your partner and on your wonderful house. P.S. Isn’t there some way you could make a little recording of you playing the piano and put it on the site so we could hear you? Do you ever give recitals? Just curious. I ENJOY your website tremendously. 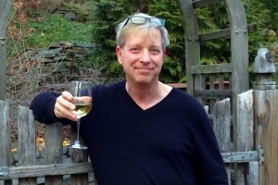 You are an inspiration and a fantastic teacher with a great sense of humor. We need more people like you who appreciate old things and are willing to restore and preserve things of beauty. I appreciate your website and have learned so many things. THANK YOU. Just found your wonderful blog! Beautiful home. Maybe floor runners might help limit the muddy boot residue to the runners and not on your lovely floors? Looking forward to going back through the archives for more gardening tips. I stopped by your house a few years back when I was visiting with Dan to return a tennis racquet, not sure if you remember me. You gave us a great tour of your home and garden. In any case I had a question that I thought you would be the perfect person to answer. We have a house that isn’t anywhere near as old…or nice for that matter, but we heat it with a wood stove and only occasionally use a room air conditioner in the summer. Here’s the question, we’re looking into buying a grand piano and I was wondering if you have issues with the wide swings in humidity that I assume you deal with also. Does that affect the tuning? Is there anything special you need to do to control the environment? Any info would be appreciated. PS, my wife is a big fan of yours, but wants to know why you always use canned pumpkin…and I promised her that I would ask. Hi John – Yes, I remember you! To answer your first question, dramatic changes in temperature and humidity do affect the tuning of a piano. To help keep my Yamaha grand in tune, I had my piano tech install a “damp-chaser” on the underside of the instrument’s soundboard. The gadget heats up and dries out the wood during our humid summers, and it releases humidity during the dry months of winter. As for your wife’s question about canned pumpkin…a lot of my readers are garden-less, and some do not have easy access to a farmers market. Consequently I like to show that some of my recipes can be made with common supermarket items. Trying to keep everybody happy! Thanks for the quick response. I figured I would post the question here since someone in the future might get stumble across it. I think the piano salesman mentioned something like that, and I’m guessing it’s the same thing. Hopefully they are not more expensive than the money I save by not using the AC that much! That’s what we thought about the pumpkin, or that most people don’t have the time to process the pumpkin (though it is quite easy in an oven). We have friends that bring pumpkins to us and my wife converts them into pumpkin bread for them…every year they bring more and more. John – If your house is basically air-tight, you probably won’t need a damp chaser at all. Regular tunings, especially at the beginning of winter (heating season) and summer (cooling season) might be enough to keep your piano happy. Good thought about the tuning intervals. I think we have ours tuned once a year, but it might be cheaper to do it twice and skip the damp chaser.